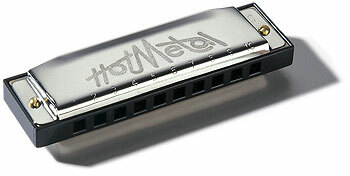 Made for the Rock or Blues fan, the Hot Metal is a diatonic harmonica with 10 holes, 20 brass reeds, and 4 inches long. The Hohner Hot Metal is a good harmonica for beginners but I consider it an economical instrument. If you would like an economical instrument you might as well save your money and get the Hohner Blues Band. The Hohner Blues Band is a very good instrument for beginners and it’s a bit less expensive. An inexpensive and easy to play harmonica, the Hohner 572 Hot Metal Harmonica is ideal for all ages. Made for the Rock or Blues fan, the Hot Metal is a diatonic harmonica with 10 holes, 20 brass reeds, and 4 inches long. A heavy plated cover and sturdy boxes provide fine construction and tone.